Friday night’s semi-finals looked enticing on paper and both delivered; Serena Williams marched into the final with a tenth consecutive victory over Agnieszka Radwanska, 6-4 7-6(1). It was one of, if not, the best performance that Radwanska has mustered against the world number one. She served well and in pulses, played some aggressive tennis. I hope she learns from this match and doesn’t back off next time because it’s the way to go! 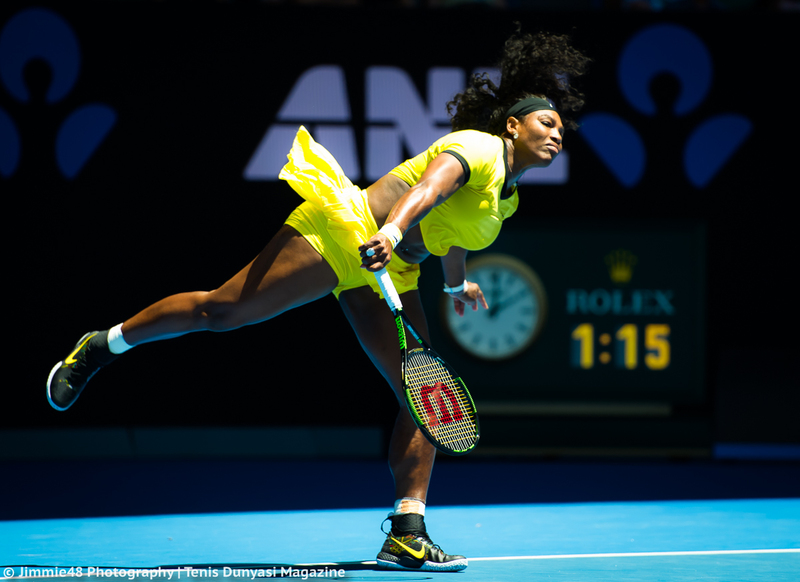 Serena started sluggishly with her footwork letting her down. Radwanska did well to notice this and take advantage. The world number three (soon-to-be world number two) went up an early break but the key to the set was her inability to back it up with a double break. The American saved four break points across two service games to stay in touch. After holding to 3-4* in the first set, Serena had something to work with and came roaring back in a blaze of return winners to win the first set, 6-4. It looked like the match would be over quickly as the world number one rushed into a 3-0 second set lead. However, Radwanska showed some wonderful spirit, producing her best tennis to level up proceedings. This wasn’t really a dip in Serena’s level, but more PEAK-Aga, going for her shots and hitting some fierce winners. Radwanska continued to stay in contention, navigating her way through the tricky serve-with-scoreboard-pressure-game at 4-5 and eventually breaking to go up *6-5. The second set was one of the best of the year in terms of quality and Serena found another level and then some. She produced a tremendous instinctive forehand pass on break point to force the tiebreak. From there on, her footwork was sharp, her serve was firing and the rhythm on return was unstoppable. Serena dropped just one point in the tiebreak to book her place in the final. The stats from both players (see below) showed what a brilliant match this was. The second of the semi-finals saw Azarenka defeat Karolina Pliskova in three sets, 7-6(1) 1-6 6-2, in another fascinating encounter. Pliskova had led 5-3* in the first set after Azarenka had played a horrendous service game at 2-2, chucking in three consecutive double faults. Pliskova threatened again on yet another inconsistent service game from Azarenka, but the Belarusian’s fighting spirit saw her survive two set points. Pliskova lost a little bite on her shots and started missing first serves (up till then, the serve had been on the money) but on the whole, it was Azarenka who turned it around in superb fashion; she played some aggressive and dynamic tennis to break back and dance through a one-sided tiebreak. Azarenka had the momentum at the beginning of the second set but failed to build on it as Pliskova saved four break points in the first game. The serving yips came back for Azarenka and continued throughout the second set, feeding into the rest of her game. Pliskova sensed her opportunity, began to strike again and won the second set handily, 6-1. Azarenka finally locks down her 1st serve in the 3rd set & finds some great angles to outmaneuver Ka. Pliskova, 76(1) 16 62. Head-to-head record: Azarenka has been one of the best at playing Williams yet she has still only won three matches! Serena leads the head-to-head, 19-3, but many of their matches have been close. All three of their clashes in 2015 went the distance; Serena saved three match points in Madrid (7-6(5) 3-6 7-6(1)), came from a set and a break down at the French Open (3-6 6-4 6-2) and then recovered from a set down again at Wimbledon (3-6 6-2 6-3) in what was by far and away their highest quality match of the year. Interesting Stat: While Serena and Vika have played each other 22 times, this will be their first encounter at Indian Wells. Also, all three of Azarenka’s victories have come in finals in Miami (6-3 6-1, 2009), Doha (7-6(2) 2-6 6-3, 2013) and Cincinnati (2-6 6-2 7-6(6)). Final thoughts: Serena-Vika matches are always fun and this is a fitting conclusion to what has been a fascinating tournament for the women in the desert. Azarenka has consistently demonstrated her ability as the number one player to contend with Williams on the court; however, in 2015, she was missing that final piece in the jigsaw. She showed that she can live with Serena for a set, may-be a set and half, but couldn’t find a consistently high enough level (often on the serve) to get the W.
March 19, 2016 in Azarenka, Indian Wells, Serena, WTA. I think it is partly friendship and the enemy of my enemy is my friend kind of situation. Since Maria has been her own undoing now, it’s basically time to play now. And frankly, I’m not sure of how much buddy buddy they still are now. But putting the personal aside, Victoria always raises her game to play Serena. Couple this with the fact that she is a good returner of the game and has a smooth defense to offense transition. When on form she is a difficult player to shake off even with a power play. She reminds me of Kim Clijsters( tennis style) when she returned after giving birth. She also had a very good defensive/retrieval game with an attack mode as soon as the opportunity came. One of the most effective ways it seems to beat Victoria is to play her game but better. That way she has to second guess herself. If Serena plays a clean game like she did sometimes against Radwanska, I feel this could end in 2 sets. Serena wasn’t at her best yesterday. But, it wasn’t her worst either. I have to say though Azarenka was at her worst against Pliskova, having coughed up 10 double faults! Serena’s averaged 30 aces to 12 double faults, along with an even 107 winners and unforced errors. She also spent an average of only six hours on court. But, Azarenka has averaged 28 aces to 29 double faults, along with 8 hours on court, having dropped two sets to Stosur and Pliskova. But, Serena is a perfect 10 for 10 on sets won – she came through the entire draw with flying colors to reach the final without dropping a set. When Serena has a slow start in one match, she has always been able to put that behind her and get her game back on track. I have a feeling this will be the same thing, as Serena herself said that Azarenka is definitely back on track after injuries and has beaten her before. Serena just has to avoid the slow, sluggish starts and get her feet moving. But, Azarenka really needs to clean up her serve if she wants to win the title. Azarenka will put up a good fight. But, I predict Serena will win this match in two sets. I agree with you 100 percent. Vika is playing Sharapova’s game. She is going big on first and second serve and that will be a problem for her. That was the best I have seen Aga played in her whole career. She served well, hit hard, came to the net, slice and dice. She saved that game for Serena. If she goes the way of Maria, it may just be her undoing also. That attitude cost Maria her shoulder and basically locked in her one dimensional play. on a side note: really didn’t like Azarenka’s comment on the AO quarterfinal loss (cited on wta_insider twitter). she said it was her match to win. that means she doesn’t give ANY credit to Angie which is odd given that Angie played lights out in the second set from 2:5* onwards. of course, azarenka made some easy mistakes but these were IMO created by Angie’s pressure and her flawless winners beforehand. Serena has a lot more determination and cleanliness in her game now. Despite her slow, sluggish matches against Putintseva & Radwanska, she seems to be the one that will eventually put people in danger. She’s the only women’s player to have not dropped a set in the tournament. I think the reason that Serena had a slow start against Radwanska was because it was very difficult to play against someone who’s a good friend and a player that she has a lot of respect for. Serena herself said that the surface was better for Radwanska anyways. But, other than that blip, she seems to still be on the right path for a third Indian Wells title. I honestly thought Serena was at her most sluggish form last night. But after seeing how many double faults Azarenka coughed up in the tournament these past two weeks, especially in her win against Pliskova, I have to say that’s even worse than Serena’s slow starts from last year. Azarenka needs to be careful to not go big on her first and second serves against Serena and that seems to be a big factor that caused her to double fault so much. Despite the six double faults in her win against Radwanska, Serena seems to be more aware of the fact that Azarenka is back on track as Serena herself mentioned before. But, I don’t think Azarenka is as aware of Serena’s strong movement and serve. Unlike other players, Serena has managed to get over slow starts in her previous matches very quickly and is able to clean up the negatives in her game big time to play cleaner matches. I predict the scoreline will be 6-3 6-0, 6-4 7-5, 6-3 6-4, 6-1 6-2, or 6-1 6-1 in Serena’s favor. What tv channel and at what time will it be showed in Punta Arenas, Chile? Well done Vika on your 2nd IW title,also with this win returning to the Top Ten on Monday,will be ranked No 8! Great speeches by both ladies….Well done! Odd match from Serena. She didnt seem willing to let herself get emotional which really hurt her getting fired up. I hope she plays Miami.